Iraq + 100 poses a question to contemporary Iraqi writers: what might your home city look like in the year 2103 – exactly 100 years after the disastrous American and British-led invasion of Iraq? How might that war reach across a century of repair and rebirth, and affect the state of the country – its politics, its religion, its language, its culture – and how might Iraq hIraq + 100 poses a question to contemporary Iraqi writers: what might your home city look like in the year 2103 – exactly 100 years after the disastrous American and British-led invasion of Iraq? How might that war reach across a century of repair and rebirth, and affect the state of the country – its politics, its religion, its language, its culture – and how might Iraq have finally escaped its chaos, and found its own peace, a hundred years down the line? As well as being an exercise in escaping the politics of the present, this anthology is also an opportunity for a hotbed of contemporary Arabic writers to offer its own spin on science fiction and fantasy. Some of these were 4 stars, others were 3 - so it's really a 3.5 (even though overly qualifying stars is a pet peeve of mine). Besides some particular standout stories, I also appreciated the project of this collection and want to see more like it. This wasn't my favorite short story collection but there were some gems, with the last two stories being my favorites. Not sure if the topic constraint or translation issues were what bugged me, but in general I'm glad that this exists and I want to see more things like it. This is such a diverse and interesting collection. I love the concept and think it takes on an important and intense mission. Some of the writing at times felt like it suffered from clunky translation and I wish my Arabic were good enough to read the originals. Baghdad Syndrome has to be one of the most beautiful stories I've ever read. I also loved the Prison story. I'm excited to check out more works by the featured authors. I have very mixed feelings about this collection. Some gems in this uneven collection. This is a mixed bag, but there are a few quality works. If you get two or three stories in an experimental collection like this that hit home, that counts as a success, I think. 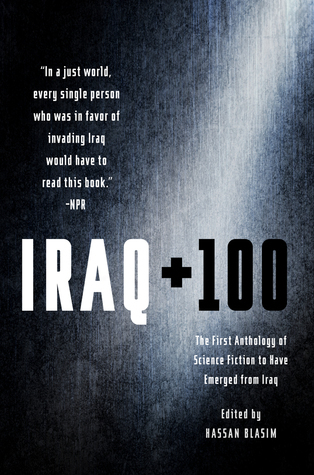 Short sci-fi stories written by Iraqis that take place in Iraq 100 years after Desert Storm. Very interesting concept. You could tell that some of the writers weren't 100% comfortable with the genre, but there were at least two or three that were incredible. Worth a read for the novelty, if nothing else. And for Western readers it is important, so we see what Desert Storm looked like from the other side. 4.5. This was a very special read for me and one that I had been looking forward to! While a couple of the stories didn’t really click with me, I was very impressed with the majority of them and found the writing and ideas beautiful.This is something that I definitely want to reread just to let the content sink in a bit more and to give myself more of a chance to review each story since I zipped through it kind of quickly. The introduction to these shorts says that there is no tradition of Iraqi SF. While some stories come thru as SF, most feel like magical realism or Wellsian social commentary. None of the are happy, which given the recent history of Iraq is not shocking, an interesting, if unhappy read with a different take on the SF genre.